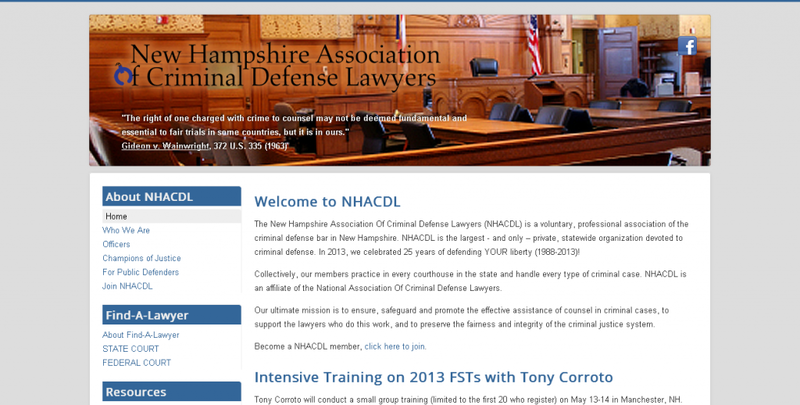 The New Hampshire Association Of Criminal Defense Lawyers (NHACDL) is a voluntary, professional association of the criminal defense bar in New Hampshire. The largest statewide organization devoted to criminal defense. I built NHACDL’s first Joomla-powered website in 2010. Recently I migrated the site from Joomla 1.6 to Joomla 3. In the process I created a new responsive template that adapts nicely to all devices: desktop screens, tablets, and smartphones. And I also installed and configured my first CRM. The site contains a large library of member-only content that you can’t see. The library is categorized by legal topics, and fully searchable, even inside the PDF and DOC files. This is the first Customer Relationship Management (CRM) system I’ve worked with. I choose CiviCRM because it’s open source, had the features we need, and is actively maintained. CiviCRM is extensive and feature rich, we will never use everything it supports. The templates are a little behind modern standards, so it took me quite a bit of time to get them to display well on small devices like smartphones. For NHACDL I also created a custom member profile to store their unique membership details like the NH Bar Association Number, and which committees members are on. The primary use of the CRM will be to manage event registrations and memberships. If you need to migrate your old Joomla website or set up a CRM give me a call.